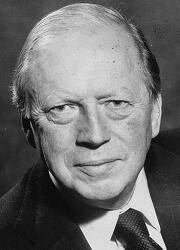 Between his boyhood days in Beaconsfield at Bishops House, which has been retained as the name for flats on what was probably its site in Reynolds Road, and his assassination by the Irish National Liberation Army, Airey Neave led a remarkable life as a soldier, intelligence agent, barrister, Member of Parliament and Shadow Secretary of State. As a schoolboy he visited Germany in the 1930s. What he saw convinced him that Hitler’s rise would lead to war and he joined the Oxfordshire and Buckinghamshire Light Infantry, a territorial unit. Upon the outbreak of the Second World War he was sent to France where he was wounded and captured. He escaped but was recaptured and sent to Colditz Castle, the maximum security German prisoner of war camp for escape-prone Allied officers. Neave’s first attempt to escape from Colditz disguised as a German NCO failed. His second dressed in a better German Army uniform was made through the trap door under the stage during a theatrical production by his fellow prisoners. It was successful and he became the first British officer to make the ‘home run’ from Colditz back to England where he was recruited by M19 which assisted escapes by British prisoners of war. One of his colleagues was Michael Bentine, who later became a founder of the Goons. 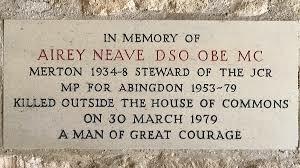 Neave ended the war decorated with the Military Cross and Distinguished Service Order. As a barrister who spoke fluent German he served with the International Military Tribunal at the Nuremberg trials of Nazi leaders. In 1953 he was elected Member of Parliament for Abingdon. When Margaret Thatcher made her successful attempt to become leader of the Conservative Party he served as her campaign manager. She appointed him Shadow Secretary of State for Northern Ireland. In 1979 he was assassinated by a bomb placed under his car which exploded as he left Parliament. Although the Irish National Liberation Army, an Irish republican paramilitary group, claimed responsibility various conspiracy theories were put forward by public figures including Enoch Powell. These included assassination by MI5 because Neave was seeking to prosecute members of the intelligence services for corruption. Another was that the American CIA was attempting to influence British policy in respect of Northern Ireland. In turn, Tony Benn had been told Neave planned to have him killed if he succeeded James Callaghan as leader of the Labour Party – a story Benn soundly discounted.